Posted December 19, 2010 by piet & filed under Mali, News. 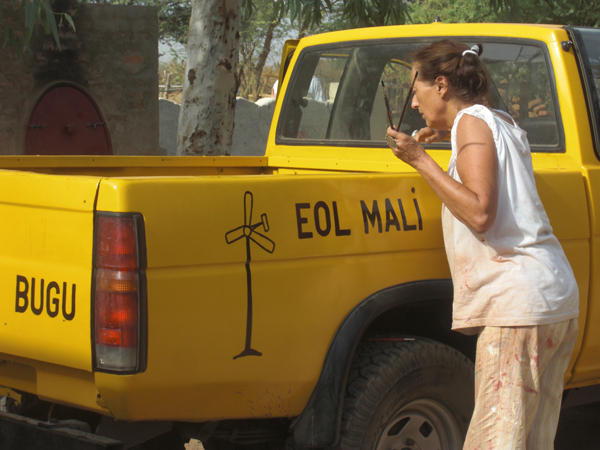 The to be setup Malian windpower company is in need of a vehicle. The vehicle will be used to transport the people from the company to the production facility, to be able to transport materials, and also to go out to the installed turbines for service and maintenance. Stichting Katalysator has donated a Nissan KingCab that they drive themselves and deliver to the people of the project in Mali, Mopti. Here you see Yvonne Gerner decorating the automobile. It has been coloured yellow so that the local police can recognise it from a distance that it belongs to the social project and will not be hassled unnecessarily.